Exclusive: Desi Williams talks 'Survivor' -- I physically and morally couldn't do the one thing that would've saved my game! Desi Williams was voted out of Survivor: Heroes vs. Healers vs. Hustlers' merged Solewa tribe during Wednesday night's episode on CBS. There was a revote after the tribe split votes 4-4 between Desi and Joe, although both Lauren Rimmer, a 35-year-old fisherman from Beaufort, NC, and Ben Driebergen, a 34-year-old U.S. Marine from Boise, ID, received one vote apiece. During an exclusive interview with Reality TV World on Thursday, Desi talked about her Survivor experience. Below is a portion of what she had to say. Reality TV World: Going into Tribal Council, you knew the Healers were in trouble and Cole Medders was safe. So what were you predicting was going to happen? I'm assuming you weren't blindsided. Desi Williams: No, I had a pretty good grasp on the fact that there was a really good chance I was going home. And I actually had a good grasp on the fact I could vote for Joe to keep myself in the game. So I had a pretty good clue what was happening. I was just having, really, a harder moral dilemma because I had gotten to a point in the game where Joe was literally the only person I trusted, and I think the only person who was -- and now I know for sure -- not lying to my face. So it became this big struggle in my head, like, do I betray the one person who I trust or do I just stay true to this one person and risk my game? Reality TV World: You were crying in your final words. Why were you so emotional? Was it just because of your love of the game, or were you having regrets over your decision not to vote for Joe since your elimination became a reality? Desi Williams: You know, it wasn't regret so much as knowing -- it was just a tough, tough call, because I knew that literally my fate in the game was in my hands. And I just physically and morally could not do the one thing that I knew I had to do to keep myself in the game, and that was to vote for Joe. So I was having a real hard internal, moral turmoil over what to do and what would be best for me, like, mentally and psychologically long-term in life vs. what's going to be good for me short-term in this game. And ultimately, I decided that I wanted to be able to trust people in life and stay true to, like, the honest person I am. And that resulted in me being voted out of the game. Reality TV World: Joe, Cole, Mike Zahalsky and yourself were the Healers left in the game. Did you think you were going to stay four strong no matter what or were you worried that someone was going to stray? Because obviously Mike flipped, so did you ever see that coming? Desi Williams: I had some concerns, but the more I thought through it, it just, to me, didn't make sense for Mike to try to be at the bottom of another alliance. That just makes zero sense to me. You might as well stay strong with the Healers and we'll navigate our way through this game so at least you're not at the bottom of an alliance. I guess what I didn't take into consideration was that Mike also felt he was on the bottom of the Healer alliance. Reality TV World: What might have enticed Mike to switch sides? Do you have any insight into why he thought it'd be better to join the Heroes and Hustlers when he'd be on the bottom of both alliances anyway? Desi Williams: No! (Laughs) I really don't! I don't know how Mike came up with that decision that he would be better off sticking with them. I mean, I guess because maybe they were in the majority at that point -- the Heroes -- but no, it still doesn't to this day make sense to me what was going through his head, this vote in particular. Reality TV World: How convinced were you that Ryan Ulrich and/or Devon Pinto was going to team up with the Healers to take out Ben Driebergen or Lauren Rimmer at Tribal Council? Desi Williams: I was actually not convinced at all that they were going to do that, especially Ryan. He seemed pretty tight into that, like, [Chrissy Hofbeck] alliance, who also was inherently a Ben alliance, which is why I thought we weren't voting for Ben, right? I wrote down Lauren's name because we had sort of decided that the four of us were going to write down Lauren and we were going to predict that [the other side] was splitting votes, and that hopefully that was going to work out for us. That's obviously not how things went down, but that was my understanding of what was happening -- the Healers would stick together and we were all voting for Lauren in the hopes that the remainder were splitting votes. Reality TV World: How do you think Joe and yourself ended up voting for different people? Because you voted for Lauren and he voted for Ben at Tribal. Desi Williams: Right, right. Again, I thought we were all voting for Lauren. I think maybe that last, kind of yelling match that Joe had with Ben maybe solidified his vote and I had gone to a confessional right before Tribal. So maybe in those final moments, he decided he was just going to vote for Ben no matter what, and unfortunately, I was gone in a confessional and wasn't there to have a conversation with him. So maybe he had made up his mind, and I was totally shocked that the Healers votes were all over the place. Reality TV World: So what about Devon? Did you think he was just going to vote the way Ryan did? Because it sounds like you think Ryan's decision was mainly based on sticking with Chrissy. Desi Williams: Yeah, it was clear that Ryan and Devon had a pretty strong alliance on the original Hustlers tribe, so yeah, I kind of thought they were one in the same in terms of where they were throwing their votes. Reality TV World: When Jeff Probst read the first set of votes at Tribal Council that resulted in a 4-4 tie between Joe and yourself, did you realize that one vote was missing? If so, what was going through your mind? Desi Williams: Yeah, no, I didn't realize, and I sort of feel foolish now watching it back that I didn't. But in the moment, you're so caught up in what name is being read and we're also sleep deprived and food deprived. So the last thing on my mind was counting how many votes were being read. All I knew was that I was on the chopping block and there was a tie and I was probably going home. So I foolishly did not realize that. 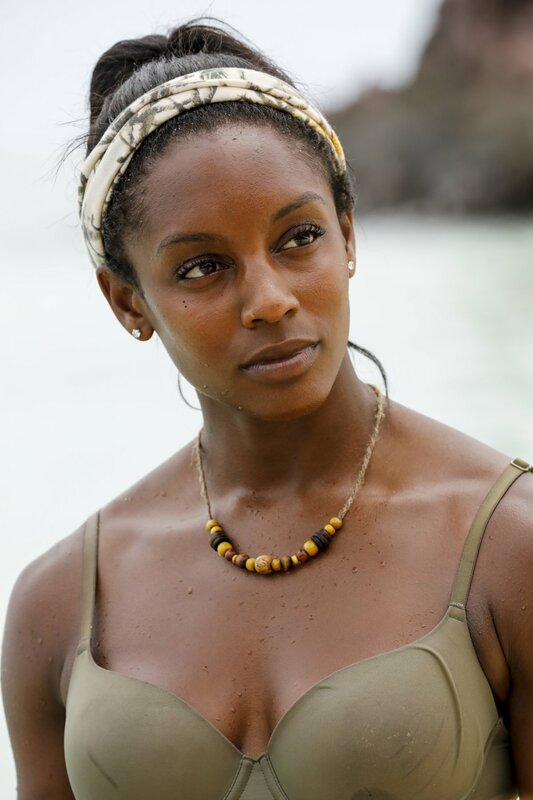 Be sure to check back with Reality TV World soon for more from our exclusive Survivor interview with Desi Williams.